A 2017 article in the online journal Authorea reports that a comparatively small portion of ships produce much of the ocean's underwater noise. 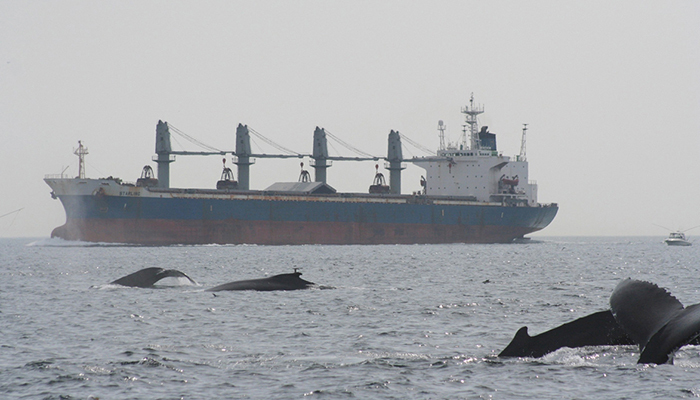 Underwater noise pollution from ships is a chronic, global stressor impacting a wide range of marine species. Ambient ocean noise levels nearly doubled each decade from 1963-2007 in low-frequency bands attributed to shipping, inspiring a pledge from the International Maritime Organization to reduce ship noise and a call from the International Whaling Commission for member nations to halve ship noise within a decade. Our analysis of data from 1,582 ships reveals that half of the total power radiated by a modern fleet comes from just 15% of the ships, namely those with source levels above 179 dB re 1 μPa @ 1 m. We present a range of management options for reducing ship noise efficiently, including incentive-based programs, without necessarily regulating the entire fleet. Veirs, S., Veirs, V., Williams, R., Jasny, M., and Wood, J. (2017). A key to quieter seas: half of ship noise comes from 15% of the fleet. Authorea. DOI: 10.22541/au.149039726.69540798.